(CNN) -- Global economic troubles are fueling a human-rights crisis, Amnesty International warned as it released its "Report 2009: State of the World's Human Rights" on Thursday. 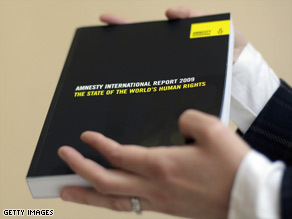 The Amnesty International Report 2009 is pictured in central London. "The economic downturn has aggravated abuses, distracted attention from them and created new problems," Amnesty Secretary General Irene Khan said in a news release. "In the name of security, human rights were trampled on. Now, in the name of economic recovery, they are being relegated to the back seat." "Billions of people are suffering from insecurity, injustice and indignity," Khan added. "This crisis is about shortages of food, jobs, clean water, land and housing, and also about deprivation and discrimination, growing inequality, xenophobia and racism, violence and repression across the world." -- Surging food prices leading to more hunger and disease. -- Economic development forcing hundreds of thousands of residents from slums and rural areas. -- Marginalized and indigenous people in countries such as Brazil, India and Mexico being denied basic necessities, despite economic growth. -- Countries such as Myanmar, North Korea and Zimbabwe using food as a political weapon. -- Countries such as Libya, Mauritania and Morocco further tightening borders against migrants, with the European Union colluding with those governments. In response to what Amnesty called "a burning need for change," it is launching a global "Demand Dignity" campaign against rights abuses that fuel poverty. The campaign's focus will include slums, forced evictions, maternal mortality, women's right to sexual and reproductive health, and corporate accountability for human rights abuses, Amnesty said. "Our first demand in our new campaign is to the U.S.A. and China," Khan said. "The United States does not accept the notion of economic, cultural and social rights, while China does not respect civil and political rights. Both governments must sign up to all human rights for all."